We had Eric, Scott and Kevin offshore today. As has been the usual the wind continues to blow a bit on the strong side and out of the east. With all the wind we have been expecting more Sailfish bites, but even though we continue to run across some the bite hasn?t increased on them. Partly cloudy and warm today as we headed out the inlet here in Ft. Lauderdale. Fishing on the reefs today for a half day charter brought us Kingfish and Bonito. No Tuna for us today. After spending over half of the morning on the Kings and Bonito it was decided to set the sights a little higher. When you are live baiting and / or shark fishing we set the live baits on tackle fitting for a Sail or reasonably sized fish. That tackle is often a match of or slightly lighter than our typical trolling tackle. On the Shark side we seldom skimp and often go with 80 pound line with baits fished below the surface, sometimes lighter on surface fished Shark baits. We needed it all today. We catch a lot of sharks. They are fun and often large and can give a good fight, which is what a lot of people like. And then sometimes they are really large and put up a ridiculous fight. 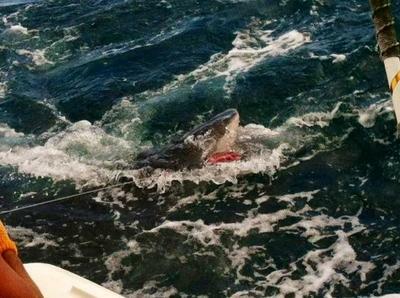 That fish in the picture is a Tiger Shark weighing well over 600, maybe 700, and easily better than 12 feet long. Very dangerous shark and a big fatty caught and released at boat side by Eric. Never underestimate what might be out there. We have seen more Tigers this year than past ones and hopefully catch and release fishing is a contributing factor. We feel so. Of course virtually all of them are quite a bit short of this one. And that?s OK, really one should never underestimate what might be out there.